FILE - A mural on the exterior wall of a store illustrates food and drinks in a commercial district of Mogadishu, Somalia, June 8, 2017. Al-Shabab and pro-Islamic State militants in Somalia are engaged in an economic war, and it is the country's business sector that is getting cut down in the crossfire. Somali businessmen and analysts say the rival Islamist groups are targeting companies to an unprecedented degree with demands for so-called taxes. Al-Shabab has already strong-armed business owners for years to finance its war against the Somali government and African peacekeepers who protect it. Now, al-Shabab is stepping up its demands, and pro-IS groups are apparently trying to fund its own activities by copying Shabab's tactics of pay up-or-pay the consequences. The groups are leaving a trail of bodies as a warning to those who don't cooperate. Somali intelligence sources say IS militants killed telecommunications official Abdullahi Ali Omar in Bosaso on August 7 for not paying up, and that they're also behind the more recent shootings of at least eight employees of Hormuud, the country's largest telecommunications company. Meanwhile, al-Shabab claimed responsibility for the shooting of businessman Nur Khayre Gutale on October 29 in Mogadishu, although it said Gutale was targeted because he was involved in the selection of Somalia's parliament in early 2017. Abdirahman Mohamed Turyare, former director of Somalia's National Intelligence Agency, says the extortion demands are strangling merchants who have managed to function, even thrive, in Somalia's perpetual state of war and chaos. "Businesses are paying three taxes today, al-Shabab taxes, Daesh [IS] taxes and the normal government taxes," he said. "The businessman who is paying these three taxes, who started his business with a small amount, is going to be forced to flee to neighboring countries because the business won't pay for itself." But not paying hardly qualifies as an option, says Hussein Sheikh Ali, who directs the Hiraal Institute, a Mogadishu-based research firm focused on security in the Horn of Africa. "If they don't pay, they will be targeted, as well as their children and wealth," he said. "The punishment is death.They have to choose between the two." FILE - Members of Somalia's al- Shabab militant group patrol on foot on the outskirts of Mogadishu. 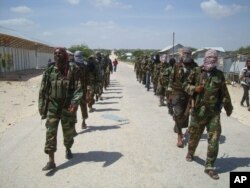 Al-Shabab is the dominant militant group in Somalia and the main threat to the business community. The Hiraal Institute outlined al-Shabab's funding system in a report issued in July. Over the past decade, the group's finance department has "become the most ruthless collection entity in Somalia," the Institute said. The report and Somali businessmen say al-Shabab agents collect "taxes" on many types of commerce in Somalia, including the sales of farm produce and livestock, and also demand money for general support and for zakat, or alms for the poor. Al-Shabab's greatest revenue comes from its system of taxing vehicles that are transporting goods through Shabab-controlled territory. "There isn't a single vehicle that does not pay al-Shabab this fee, regardless of the goods it's carrying," said "Shabelow," one of several businessmen who spoke to VOA's Somali service about their experiences with al-Shabab on condition they remain anonymous for safety reasons. Shabelow, a fuel supplier based in Mogadishu, says al-Shabab charges him $2.50 for every barrel of fuel he transports.He says the money is usually collected in the city's Bakara market, a remarkable fact given that the Somali capital is ostensibly in the hands of the government and the African Union force, known as AMISOM. Many other fees are gathered at Shabab-run checkpoints on roads in the interior. Shabelow says al-Shabab tells traders that if they don't pay the fees, their trucks will be "blown off" the road.That's exactly what happened during a June incident in Somalia's Bakool region, when the jihadist group destroyed 11 vehicles and killed six civilians for failing to pay up. Al-Shabab sometimes seeks out more random payments from businesses, schools, hospitals and individuals, categorizing the payments as infaaq, or support for the group. "Mumin," another businessman, says the demands can be unrealistic. "They might ask someone to pay $100,000 even though his business is not worth that amount," said Mumin. "Eventually the person either accepts to pay the money asked or faces imprisonment. "Mumin said one businessman who defied al-Shabab was chained to a tree by his arms and legs and left there for hours. "They say, 'You are a wealthy man, there is work going on, you have to contribute,'" Mumin said. "No businessman or business owner escapes from this, no one." How much does the group collect using these tactics?No one knows for sure, but Sheikh-Ali (formerly known as Hussein Moallim Moahmud) says the amount has been increasing annually. "We estimated that in 2017, the best year they have had, they collected $27 million," he said. The U.N. Monitoring Group on Somalia issued a report in November that said al-Shabab draws roughly $10 million a year from just one checkpoint in Somalia's southern Bay region. The monitors' report, which addresses general security challenges in the beleaguered Horn of Africa country, also said al-Shabab "generates more than enough revenue to sustain its insurgency," and functions as a shadow government with "a centralized taxation system applied consistently across southern and central Somalia." "Al-Shabab operates a state within a state, where ... in terms of taxation it operates more effectively than the federal government," said Matt Bryden, the former chief of the U.N. Monitoring Group, now director of Sahan Research, a Nairobi-based research firm. "And I think this is simply what any serious group aspiring to power in Somalia would do, amass a base of revenue domestically and begin to compete for legitimacy with other authorities." The Islamic State faction in Somalia is much smaller than al-Shabab, having formed only in 2015 when a pack of militants splintered off from Shabab during a dispute over whether the group should switch its main allegiance from al-Qaida to IS leader Abu Bakr Al-Baghdadi. Until recently, IS was active only in Somalia's semi-autonomous Puntland region.But the recent wave of attacks suggests they are expanding their reach. Somali intelligence sources say IS set off a bomb outside Mogadishu's Salama bank on September 14 after the bank defied the group's extortion demand.Three days later, gunmen in Mogadishu attacked a senior bank official, Abdulkadir Haji Wasa, firing bullets into his head.Wasa survived and is now being treated in Turkey, where he is said to be in critical condition. Security officials say they believe after three years in the remote mountainous region of Puntland, the IS militants found that if they want to survive they have to return to the cities and raise funds. Targeting the businesses is a part of the drive to impose themselves in urban areas, they say. The Somali federal government and various regional authorities, which have struggled to stop terrorist attacks by al-Shabab and IS, appear largely unable to protect the business community from the extortion demands. Former intelligence director Turyare says that while in office, he met with businessmen facing militant demands for money, but was only able to offer "advice." Sheikh-Ali notes that militants have been known to attack targets in their own business places, or even mosques and universities. It leaves the typical business owner very few options, he says. "They have to choose to defend themselves, or stay in a place where they can be defended, or accept to pay al-Shabab," said Mohamud. "The punishment is death, and you do not know where [the militants] are coming from, and where they are going to make the kill."